Useful, tasty and low calorie content. 6 pcs beets; 2 garlic heads 1 tbsp. l. olive oil; 1 tbsp. fresh coriander; 1.5 tsp. vinegar; walnuts and green onions – to taste. Pour a small amount of water into a saucepan, put the beetroot and unpeeled garlic in a container, cover and heat for 10 minutes in a microwave oven or cook for a short time on gas. Shake the roots on a coarse grate or pour the garlic, peel and crush. Add olive oil, vinegar, coriander, a small amount of green onion (if desired) to garlic. Mix the contents thoroughly. 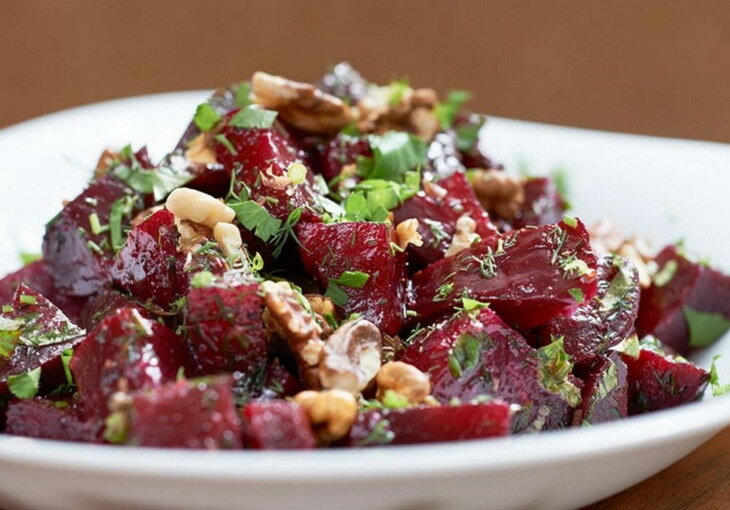 Pour the beetroot sauce, let the salad stand touch it again and "season" with chopped walnuts.